The Lighthouse at Pelican Rock, geared towards young readers aged nine to 12, is a memorable story about a young girl - Megan Evans - who faces a health crisis and almost dies. Megan is sent to live in a tiny coastal village called Pelican Rock with her aunt Rachel in a bid to recover after her near-death experience. On the long train ride, she encounters a man - Rhys - who not only grew up in Pelican Rock, but knows her aunt. Upon arriving Megan learns a little about the history of Pelican Rock and becomes enthralled with the island’s pelican inhabitants and the mythical stories surrounding their place at Pelican Rock. 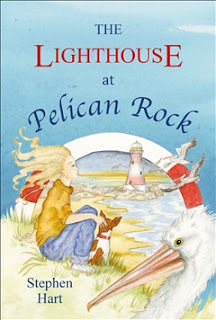 A day trip to visit the ruins of the old lighthouse leads Megan to wanting to discover more about its history and that's where the magic of this book really come into its own. It's not long before Megan finds out just how magical the pelicans are, and Megan finds herself back in time, or is it just a dream? I really enjoyed the story, it evokes feelings as a reader as you learn more about Megan's home life and her yearning to find a place where she truly feels at home. The scene that is set throughout the book feels historical and really lends itself well to the storyline. The writing is clean and easy to follow and keeps you guessing about what magic is happening on the little seaside town of Pelican Rock. The images by Kathy Creamer help add to the storyline and give you a feel for Megan and what is being told.